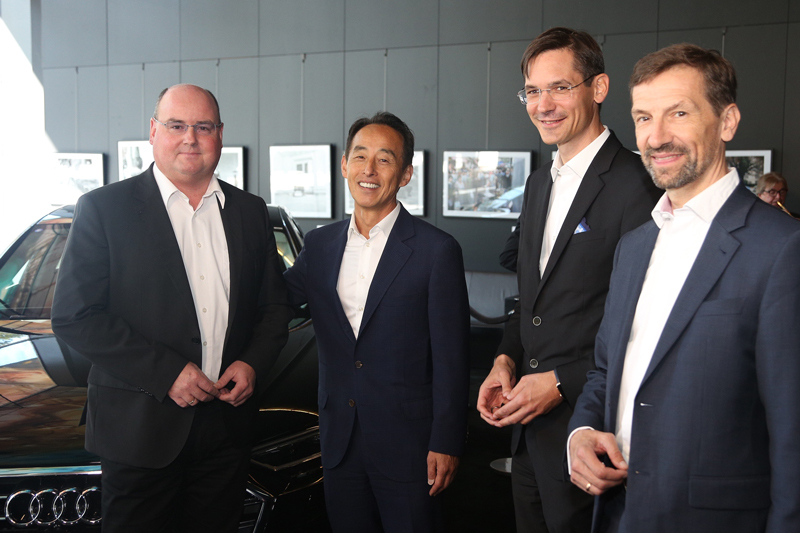 Samsung and TTTech unveiled details of their strategic partnership and talked about why collaboration and openness are the most important factors when developing technologies for automated driving. The TTTech executive board Georg Kopetz and Stefan Poledna welcomed Young Sohn, President and Chief Strategy Officer at Samsung Electronics, in Vienna for a joint press conference alongside Ricky Hudi, Founder & Managing Director at FMT – Future Mobility Technologies GmbH and member of the TTTech supervisory board. Young Sohn started his statement with the fact that he is convinced that the automotive industry is going to change forever and market will be expanded. With entering the automotive domain, Samsung aims to make the car experience better and safer. Therefore, Samsung has decided to choose TTTech because of its rich cross-industry functional safety background. Young Sohn emphasized, that such partnerships and collaborations will be crucial in the future. The company would like to encourage startups and innovative high-tech growth companies to push the envelope and create open platforms with their technologies. Samsung also established a new Strategic Business Unit dedicated to the Future of Mobility. For TTTech’s founders and executive board members Georg Kopetz and Stefan Poledna, this partnership is a giant leap. In its nearly 20 years of existence, the company has constantly strived to build an international ecosystem of partners and create open platforms that enable their partners to improve the safety and reliability of electronic systems. With Samsung’s investment and support as a strategic partner, TTTech will create solutions for the next generation of highly integrated and data-intensive safety systems and accelerate the development for level 2 and level 5 autonomous platforms. As this is a milestone for TTTech, the board seized this opportunity to express their gratitude towards the whole TTTech team for their support during the years and especially during the last months. Ricky Hudi concluded the panel statements by emphasizing that this is a transitional moment for the automotive industry. He also explained how the new technologies will affect future architectures. Find out more about the partnership in our recent press release.